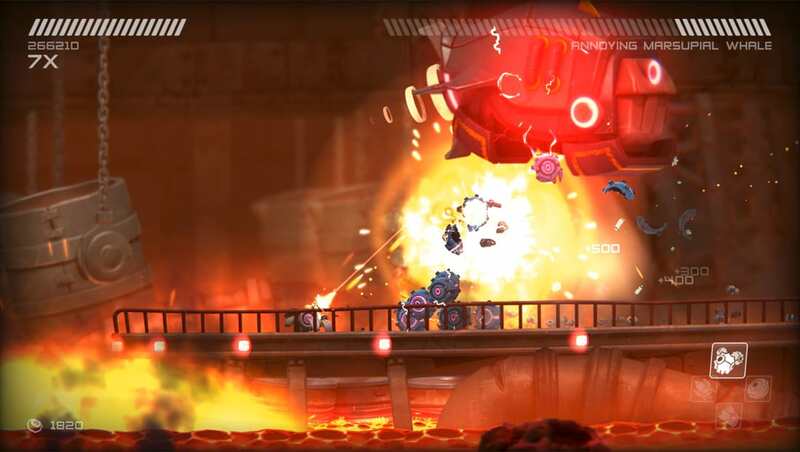 Rive is an adaptation of the sub-genre Shoot ’em up for the molds of platform games . Full of references and with enough humor, it can be said that the title is a rereading of the Run and Gun style for modern days. The entire game was created by the only three members of German developer Two Tribes who even announced that Rive will be their last release. Despite this, the game is still being updated and will even win a version for Nintendo Switch. 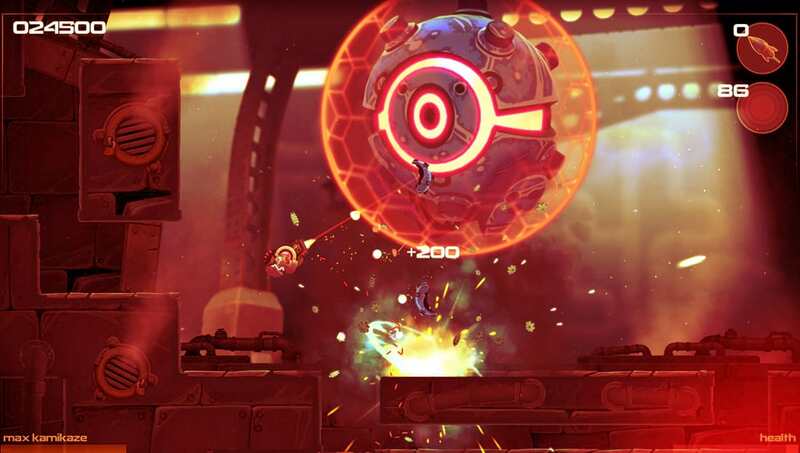 RIVE is a shoot-em-up platformer created by the Dutch video game company Two Tribes. The story of the game is poorly developed and deep down, the title proposal is not to be a narrative innovation but to update its genre with new ideas and mechanics. During the game, you control Roughshot, the spider tank pilot. You end up finding a spaceship as you explore the space and decide to plunder. After a while you get stuck in it and when trying to escape, you are prevented by Daryl LLoyd-Lancaster the robot responsible for managing the ship, who does everything to stop you from reaching your goal. It is possible to realize that the story exists only to motivate the player to continue exploring the ship. If it did not exist, the game would just be a collection of different phases introducing new mechanics with varied enemies. Therefore, it acts in a way that allows the shooter to have a solid space to develop. Other than that, the dialogues are very interesting and full of references. The game at various times makes fun of yourself and your limitations. You probably will not laugh out loud, but that leaves things more relaxed. The Two Tribles team had very well defined what they wanted when they developed the game. He is a simple, linear platform shooter with a little humor and he has no claim to be anything beyond that. This simplicity opens space for the game to shine in what it proposes to do: combat and level design. 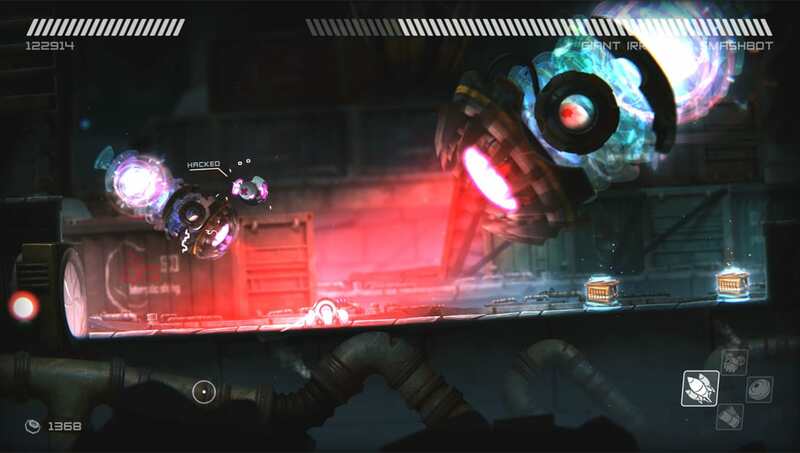 In Rive, you control a spider-shaped tank that fights against hordes of robotic enemies. Your tank has a machine gun with infinite ammunition and can shoot 360 degrees. Enemies come from all directions and have varied behaviors: some throw themselves at you, others launch projectiles, guided missiles, others still go through the map as if they do not want anything. With these elements combined you have a perfect recipe for a chaotic and frantic game. That’s because we have not even started talking about the camera shaking with impact. Fighting during the game is always cool and challenging. But in general, the fun is due to the level design. At times it is possible for you to fail miserably over and over again until you can pass a certain level. The amount of different enemies is not so great. That’s a fair amount considering the size of the game and the fact that it was made by three people. But of course it would be nice to have a wider variety. Knowing this possible defect of the game, the developers decided to choose to create more interesting phases that could create new game mechanics, but mainly to take good advantage of the interaction between the mechanics implemented. By the end of the game new ways of playing will be introduced and even those that are already known end up being exploited differently. This creativity brings renewal to the game, which does not become annoying or repetitive. Of course not everything is perfect and the formula used is obvious and if you pay attention, you will understand how the game actually repeats itself in disguise. But this has been done with care and does not really impact the player’s experience. It is worth mentioning and praising again the concern of the developers with Level Design. Not only are the stages well explored in order to test the player and his understanding of the mechanics of the skills, but also the intention is to allow each phase to have its optimum way of being played in a speedrun competition scenario. The well-defined behavior of enemies and fights allows the player to carefully plan how to minimize the time on the timer. Perhaps a better implementation system would have been positive because it could bring more diversity to combat. But even that ends up contributing to the frenzied speed of the game since the player will hardly even stop to study their possible improvements and their impact on the game – which is very low, by the way. Despite the very short campaign lasting a maximum of 7 hours, Two Tribes has bet on ranking players by scoring campaign missions and in-game modes to increase Rive’s replay factor. This way, players will be able to go in search of special achievements and try to obtain better positions in a global ranking of Rive players. Through the Speed ​​Run modes that add a timer to the missions and Single Credit where you only have one life, you can make the title earn much more than the hours needed to end the campaign. The game itself is difficult by nature and that is the purpose of the title. Even in normal mode you will still encounter challenges. Playing Rive in difficult mode is no different from playing in Normal mode in terms of mechanics or the artificial intelligence of enemies. What changes are the game multipliers like the amount of health lost in the attacks, the life that the enemies have, how much HP you recover with the orbs of life etc. In some moments the game comes to remember the difficulty of Super Meatboy, where you repeat several times the same phase and always die in the same place until you fight in an impeccable way. Despite dying several times, the checkpoints are very generous and the game usually gives you a teaspoon making ammunition for your special ability and life orbs to be dropped by enemies when you are reborn. In its graphics and in its appearance, Rive counts with simplicity and good execution, everything to be able to extend even more the chaotic sensation of the battles. We see again a well-used principle that is to differentiate the saturation and the tone of the colors of the environment and the elements involved in the main mechanics, in the case of the battles. In Rive this principle is deepened and combined with sound effects. Just as every enemy has its particular sound, its attacks have very different visual responses, which help the player to guide himself in the midst of enemy hordes and understand what is causing damage. In addition to the life bar, the game also has another way to inform the player about their low amount of HP, the same used in some FPS, which is the red outline of the screen. It is a subtle way to simultaneously inform the player’s life without having to divert attention from fights and also make the game more difficult, simulating a debilitation due to injuries. 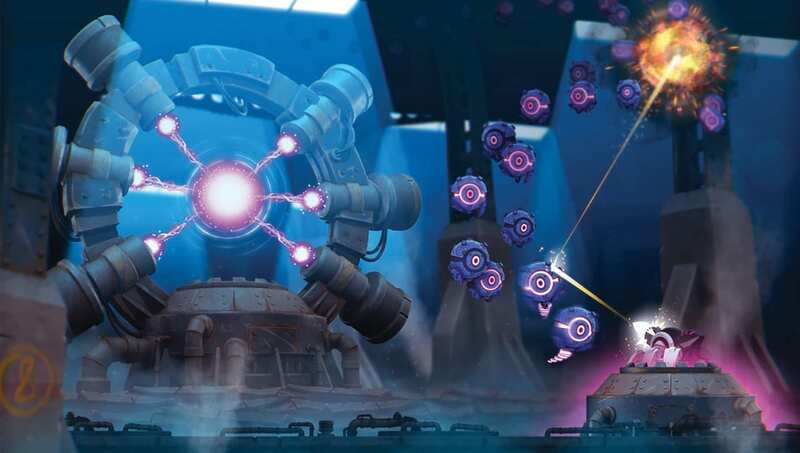 Due to the nature of the game that is technological and robotic, Rive adds to this idea a layer of static, to simulate the camera of the failing spider tank. This kind of detail may seem silly, but it is the combination of them that makes the experience more enjoyable and in that case even serve to make the game universe more coherent. Just like all the other elements of the game, the camera and its movement has the sole purpose of making the battles more intense. She follows the tank in her movement – and it moves all the time so the camera does not stop – and it shakes with hurt damage. You can see that the battles have everything to become chaos. Although the graphical options menu offers nothing beyond the ability to change the screen resolution, you probably will not need it. The squeegee plays smooth even in the most intense battles and the minimum requirements are low. The sound of the game was carefully thought out so as not to overwhelm the player in the most intense moments, but at the same time provides satisfactory feedback of the battle and what is happening in the environment. For example, you may hear a specific noise on the side that a certain enemy will appear or attack. This sometimes in the midst of an epic battle may not be so obvious to the player, but the auditory record is realized and this type of resource ends up providing more dynamism to the battles, the notion of cause and effect within the game and a consistency that is very important in games. Two Tribes opted not to load the game with audio effects to simulate the muffled, metallic sound you would have on a ship. Post-processing audio was not the focus of development, you do not have audio occlusion and echoes, for example. Even so, you have an ambient sound that matches the location, consisting of electrical wiring and mechanical sources. This helps to give an atmosphere to the game, which is pretty cool since this does not disturb the battles at any time. Music is present in most of the game, and its intensity is directly related to the tension of battles. The harder the fight you are facing, the more agitated and loud is the music. Therefore, it is mainly noticed in the rooms where the main and most difficult struggles take place. When the music starts playing louder, you know that bad things are coming out there. It nicely complements those moments of greater adrenaline with a very varied Techno track. Although it has a Portuguese translation, dubbing is only available in English. Although this can be a negative point for many people, the quality of the dubbing is very good. Mark Dodson who dubbed characters in Star Wars and the films Gremlins was responsible for giving voice to the two characters in the story. His experience and ability can be seen in speech and interpretation. The last title developed by Two Tribes did not disappoint. It was a nice farewell gift, being fun and quite challenging. The campaign is very short, but the replay factor is there for players who want to climb the global ranks and collect achievements. If you are a fan of the genre or enjoyed what you saw here, you will probably have a great time with the game, even after the 30th death followed in the same phase.